The yogurt in this recipe from Evelyn Rose's The New Complete International Jewish Cookbook makes these unusual scones develop a fluffy texture, and golden raisins, or sultanas, add a touch of sweetness. For different flavors, add other dried fruits. Dried cherries, dried cranberries, dark raisins, dried blueberries, chopped dates, and Zante currants all would provide a new spin on the original recipe. Another option would be to add chopped pecans, walnuts, or almonds, either alone or mixed with the dried fruit. Heat the oven to 425 F. Line a baking sheet with silicone or parchment paper. In a large bowl, mix together the flour, baking powder, salt, and sugar. Make a well in the center and add the yogurt. Mix with a knife into a soft, non-sticky dough. Turn the dough out onto a lightly floured board and knead gently for 30 seconds to smooth the underside. Roll the dough to a thickness of 1/2 inch and cut it into 12 rounds with a pastry or biscuit cutter dipped in flour. Place the scones on the prepared baking sheet and brush with yogurt or sour cream. Scatter the tops with sugar and bake for 12 to 15 minutes, or until the scones begin to brown on the top. Eat warm straight from the oven or cool. 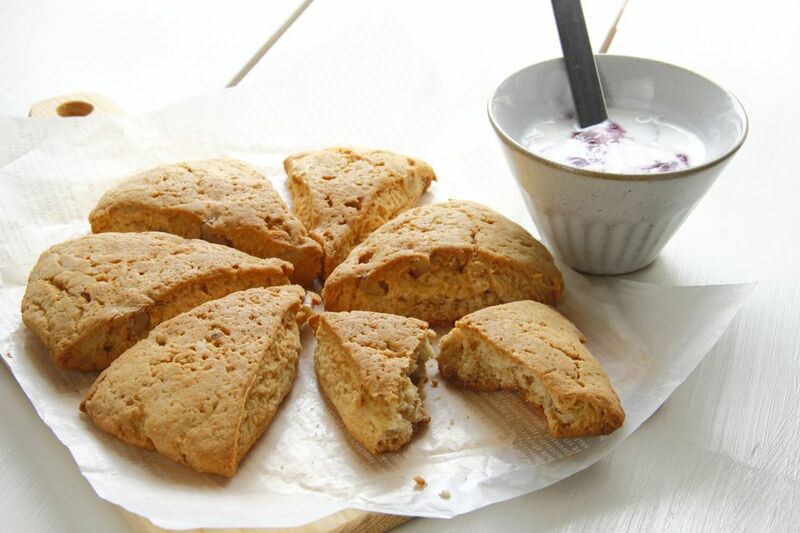 You can freeze yogurt scones for up to three months. For a traditional take, serve these yogurt scones with clotted cream, jam or preserves, and tea. This is part of the quintessential afternoon tea menu throughout the U.K.—as it has been for generations. If you aren't into that kind of snack at 4 p.m., have these delicious yogurt scones for breakfast either with clotted cream, if you want to go the authentic route, or butter. Preserves would be good, too, but the fruit in this recipe really fills that bill. Go on and have that tea—maybe Irish or English Breakfast—but if you really love coffee more, go for it. Don't be constrained by scone tradition.